Several members of the 2015 8th grade class are continuing on at WCA as we launch our high school program in the 2015-16 school year with a 9/10 combination! WCA will have a 7-12 Upper School over the next three years. Westside Christian Academy Mitch from Z MEDIA on Vimeo. Music licensed through Premium Beat. Have a video about your experience at WCA or what you have been doing since you graduated? Please contact our Headmaster, Jim Whiteman, with the details. We have the date for our next reunion! Watch this page for more details as they become available. Want to help plan the event? Please let the Alumni Committee know by contacting WCA. Thank you to all the alumni and their families who came to the 2015 Alumni and Family Reunion on one of the very rainy days we had this summer. 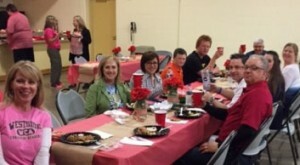 We had great food, fun, and fellowship with other alumni and WCA teachers. Special thanks to 2002 alumnus Carmen Pescatrice, owner of MC DJ Company, who provided the entertainment. WCA Alumni, we want to hear from you!! We love our former students, whether you attended just one year or nine. Click on the link below for the WCA Alumni Form to help you stay connected with us and other alumni families. You or your family may have been receiving our Excelsior newsletter quarterly when you attended. It’s now monthly with news, articles, video, calendar of upcoming events, and more and available by email. Subscribe today!